U of M athletic director R.C. Johnson: "I want to assure Tiger Nation that we checked out every viable candidate, and now it's time to move forward. [Josh] is a man with a wealth of knowledge, a wealth of experience. He's known as one of the most successful Division I recruiters of all time. He's learned basketball from his father, and two incredible basketball coaches -- Lute Olson and John Calipari. He's extremely smart. He graduated from college in two-and-a-half years. He's extremely capable. Everything we do, we'll continue to do with class, dignity, and style. Ladies and gentlemen, Josh Pastner." 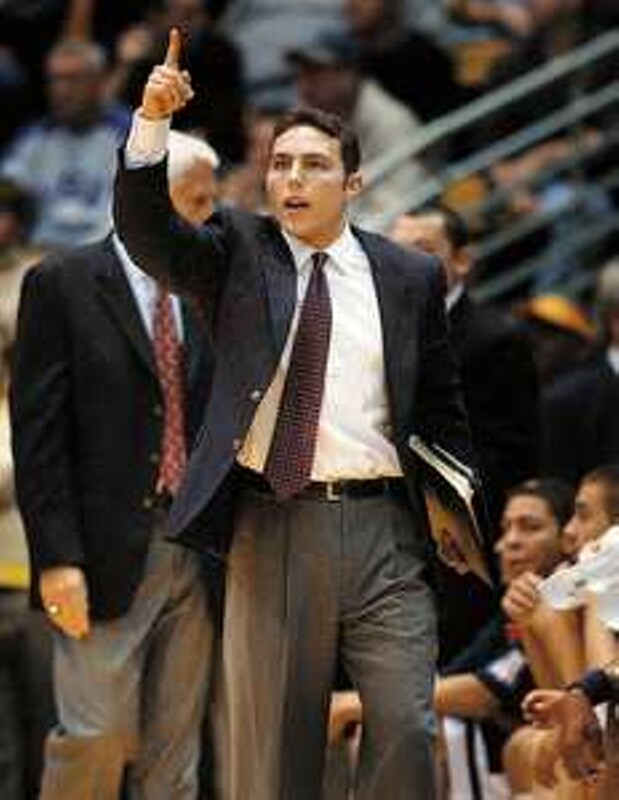 Josh Pastner: "Wow. Things happen so fast, in the blink of an eye. I'll tell you this: This is the most humbling experience that I've ever encountered. There 86,400 seconds in a day, from midnight to midnight. You realize how precious life is, and how fortunate things are. When you get an opportunity like this, it's humbling. I -- 100 percent -- totally realize the responsibility Ive been given. I fully realize it. "I believe in myself. I've prepared myself for this. My dad's over there, and I remember when I was in 5th grade, watching the Celtics and Lakers play. I went to my dad and said, if I can't play in the NBA -- and I blame my parents for my athletic ability -- the next best thing is coaching. I remember that day. My focus has always been that, if I was to become a head coach, I'll be around and mentoring student-athletes. And it's not athlete-students; it's student-athletes. I took academics seriously, and that's something thats important to me. "The standard of excellence here has been set. Unbelievable. And I'm excited about keeping this program at the highest level. We don't want any slippage. We want to keep it rockin' and rollin'. The way to do that is to get great players, coach them up, make sure they're prepared in every which way. One of the things I like to say is the 'Five Ps': Proper Preparation Prevents Poor Performance. We have to be prepared, to work, and get the best players. "The key is those [players] in the back of the room today. Bottom line. They're the ones who put the program where it is today. Not coaches, the players -- a hundred percent. "This isn't my team. This is our team, the community's team, the fans' team, the players' team. I say that because success at the University of Memphis is great for the entire city of Memphis. I cannot do it alone. I'm going to hire a great staff. We need the support of everyone, to make this even better. It's us, it's we, it's our team. I look forward to accepting this responsibility. One of my favorite sayings is, 'The foundation of all excellence is positive belief.' If you think positive, great things will happen. This is an exciting time. It's gonna be fun. "I had a meeting with the players this morning in the dorm, and I told them, we can do what we need to do, have fun, stay together. We want to have a great year next year, and surpass what we did this past season. Our goals remain the same: We want to win conference titles, get to the NCAA, and advance as deeply as possible. Go Tigers. It's a humbling experience. I thank everyone for coming out. I want to thank the players. I'm going to get them to stay and see if they can graduate in three years!" On the hiring process: "[Monday] morning, I was packing my boxes up, ready to rock and roll to Kentucky. Then R.C. called me and told me to come on over. It was spur of the moment, no hesitation. I jumped on it right away. It all happened in the last 24 hours." On his coaching style: "I've worked under Lute Olson, who's already in the basketball Hall of Fame. And here with Coach Calipari. In Arizona, believe it or not, we played faster than we have in Memphis at times. Up-tempo, attack, get after it. I'm not a guy to run a set play every time. I want to give them freedom to create their own shot." "He said, 'You don't have a job at Kentucky anymore. You're fired. Take the job!' He asked me why I came here. He said this is the premier, elite job in America. Unbelievable support, the community is so involved. It's a gold mine. Obviously, I wouldn't have done anything without his blessing, and he gave me his blessing." "My phone has been ringing off the hook. I delete a text message and 150 more come in, just like that. When R.C. offered me the job, the first thing I said to myself is, 'What do I need to do to make sure my things are in order?' Number-one was the players, number-two the recruits. After that, I'll go from there. I've got some ideas, staff-wise. We'll get the best I can get, guys who are future head coaches. Guys who can coach, recruit, and deal with academics, do everything." "We're in the midst of talking with them. We'll have to wait and see. For 10 months, they'd signed to play for Coach Cal, even when I was recruiting them. We'll see. No matter what, we're going to go and get great players. Coach Olson used to always say there are three things you need to win championships: players, players, and players. It doesn't guarantee you win a championship, but it gives you a chance. You also need good guys, good teammates who care about the university. We want guys coming in here who bleed Tiger basketball." On his youth (age 31): "Age is a number. Age is overrated. If we were worried about age, Obama wouldn;t have been elected, Tiger Woods wouldn't be doing what hes doing. It's about production, about you as a human being, how you treat others. What's in your heart. It comes down to integrity and honesty." On recruiting in Memphis: "We will recruit inside-out. We want to keep kids who are good enough here in the city, in the state, whatever. But the kids have to be good enough, academically and athletically." "I'm jacked, ready to rock and roll. I'm not much of a sleeper, and I don't drink coffee either. I'm a high-energy guy. I love life. I'm a morning guy. I believe the best way to live your life is to be positive. From there, we'll take the next step."